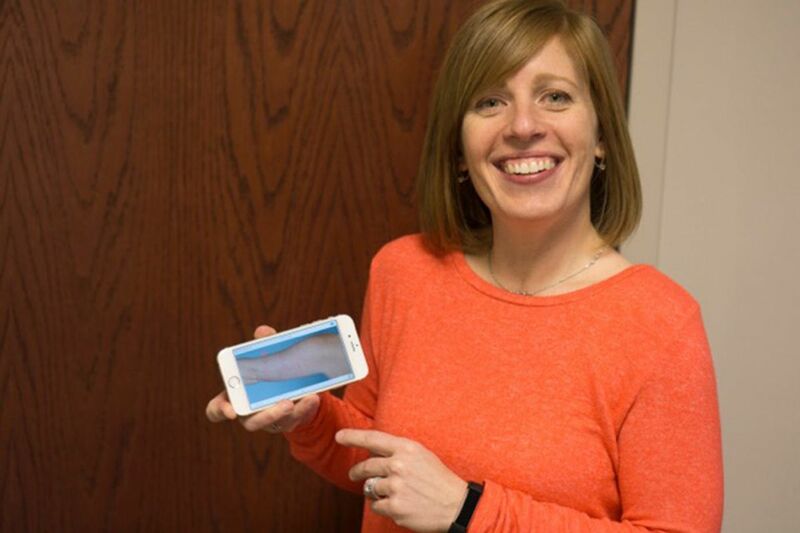 Kim Herrity shows an image of her upper arm as it appears on a smartphone app that helps her monitor skin changes. Four years ago, Kim Herrity noticed that a dime-sized mole on the back of her leg had turned itchy and black. A subsequent biopsy revealed stage 3 melanoma. Since having the mole removed along with a lymph node in her groin, Herrity, 38, has remained cancer-free. But melanoma is prone to recur – sometimes in unexpected places that are easier to miss even than the back of a leg. Yet studies indicate that most people in Herrity's situation don't monitor their skin for new growths. Herrity, who works in quality assurance for a software company in Allentown, is in the minority. She participated in a six-month study of a new mobile app called MelaSight. Developed by dermatologists at Penn Medicine, it is designed to help high-risk melanoma patients track early changes in their moles and spots between dermatology visits. There is a clear link between conducting your own skin examinations and finding melanomas while they are thinner and more treatable. Yet as few as 7 percent of U.S. adults check their skin regularly. Among people in high-risk groups, the rate is just 10 percent. Here's how MelaSight works: Professional photos of a patient's skin are uploaded onto a password-protected mobile site. The photos also are encrypted to ensure privacy, given that this is a record of the entire body. Using the camera in their smart phones, patients can zoom in on suspicious skin changes, which are automatically compared with the images taken earlier. Patients can flag areas of concern for their doctors to check out right away, and make note of them for future reference. The app also lets patients such as Herrity who are at high risk for future melanomas, track whether they meet the once-a-month goal for self-exams. Penn already uses total-body digital photographs, printed out or stored on a CD, to help patients and doctors check for new or changing skin lesions. But comparing a new lesion with a photo record is far harder than using a phone app that automatically makes the comparison, doctors said. Penn dermatology professors Emily Chu, Michael Ming and Carrie Lynn Kovarik studied the new app, which was developed to help high-risk melanoma patients monitor their skin. "The hope is that greater satisfaction with the mobile app, compared to printed photos or digital prints, will lead to increased skin self-exams and earlier detection of melanomas," said Michael Ming, associate professor of dermatology at the Hospital of the University of Pennsylvania and one of the study's authors. When it comes to choosing between the two methods of self-examination, Herrity said she prefers the mobile tool. "Using the app, I can watch the growth and progress and changing of spots on my skin," she said. "I can screen-shot any changes, then send the pictures to the doctor to see if she wants me to make an appointment to come in." In the trial study, participants were divided into two groups: those using the app, and those who used photos that were printed or stored on a CD. Results show that patients using the app reported a 94 percent satisfaction rate over six months, compared with 54 percent for the group employing prints or CD images. The print photos were especially unpopular, said Emily Chu, assistant professor of dermatology at Penn Medicine and an author of the report. "They found the prints inconvenient," she said. "They needed to be physically stored somewhere and keeping them away from family members and children is important because they are fairly revealing." Researchers also looked at whether having a smartphone app loaded with a patients' photos could help improve the skin self-exam rate. But the two groups performed identically: one in five performed the exams at the start of the study, increasing to 37 percent six months later. Future studies on this topic are ongoing. "Self-examination is actually a very difficult process," Ming said. "Some patients have hundreds of moles on their body. Trying to find what's changing or new when you have hundreds of different spots can be very difficult and discouraging for patients." The physicians are working to make the app available to other patients in their clinics, not just those enrolled in the study. "A lot of patients walk into a doctor's office thinking that any physician or dermatologist can detect melanoma," said Chu. "We've all seen cases where there are melanomas that don't look obvious, so in those cases it's extremely helpful for a patient or family member to point out a skin lesion to the doctor because no one knows their skin better than themselves." Just knowing whether anything has changed on the skin is immensely helpful, Ming said. "It's all about early detection," he said. "We tell the patient if you have something that looks funny but has been like that for 10 years and you're confident it hasn't changed, I'm less interested in that than the spot next to it that looks ordinary that wasn't here six months ago." "That's where these tools can really help," said Ming. Herrity also appreciates that she can use the mobile app in private, anytime she wants. "If I'm at work wondering, 'What is that thing?' I can run into the restroom, whip out my phone and say, 'It's nothing.' I don't have to wait," she said. "If I'd had the app for the mole on the back of my leg, who knows?"